Lil Rounds continues to be in DEAD last place in America Online's "Who Should Win" Poll. One person who has increased her stock lately is Allison Iraheta, she's #2 after Adam Lambert in AOL's popularity poll. Last week American Idol Producers gave Lil a needed boost by showing her three children — which likely sent many thousands of voters to the telephones in her honor. It was a touching scene! NOW, back to reality, . . . we're looking for a fantastice vocalist, and NOT a touching story. I'm not crazy about her personality, but Allison can sing her face off! Performances DO make a difference. Allison Iraheta moved up to #2, ahead of Danny Gokey, in the post-show AOL Poll. Now look at last night's DIAL IDOL results; see which contestants moved UP or DOWN compared to last weeks DIAL IDOL results. Compared to last week's Dial Idol Results, the Big Loser is Kris Allen, and the Big Winner for the week is Allison Iraheta! When Dial Idol factors in a statistical "margin of error," then it is predicted that ONLY Adam Lambert is completely SAFE from even being in the Bottom Three. The other 7 contestants actually have a CHANCE of, not only being in the Bottom Three, but to be eliminated as well. In light of last weeks Dial Idol results that had in him in the #2 position, if Kris is eliminated tonight, that would be a shocker! 9 - Megan Joy Corkrey — "Turn Your Lights Down Low"
She hit her pitches this week. Her performance was moderately entertaining. I make my mind up on how I appraise a performance BEFORE the judges open their mouths. So, I didn't GET the same thing the judges were GETTING. I rank her second to Last, not because she did that BAD, but because there were 7 performances that did better. Megan's time will soon be up. Different from Adam Lambert and Allison Iraheta, Megan CANNOT sing the phone book — she needs just the right song to fit her narrow and unique abilities. If her fans want to see her pretty face next week (never mind the singing), she may well survive elimination again. Remember: She wasn't even IN the Bottom Three the previous week. It was Anoop and Matt, who joined Michael Sarver in the Bottom Three. 8 - Lil Rounds — "What's Love Got To Do With It"
How many times have contestants been told that song choice extremely important? This season's group have been making horrendous song choices with greater frequency, compared to all other seasons (Maybe it's just that the Judges, and America, have evolved and refined the way the Am Idol Contest is played?). Speaking of song-choice, Lil Rounds is the absolute WORST at picking songs! Weeks ago, she sang a Mary J. song in a way that made me think she could be Top 3 material. Since then, she's had a knack for creating "song choice" poison. Choosing a songs from her Birth Year, Lil picked "What's Love Got To Do With It." Her performance came across quite Karaoke, and a complete Kopy Kat of Tina Turner. The Judges are dead right in their assessment: Lil needs to create her own persona (like Allison and Adam and Danny Gokey do every week, consistently). 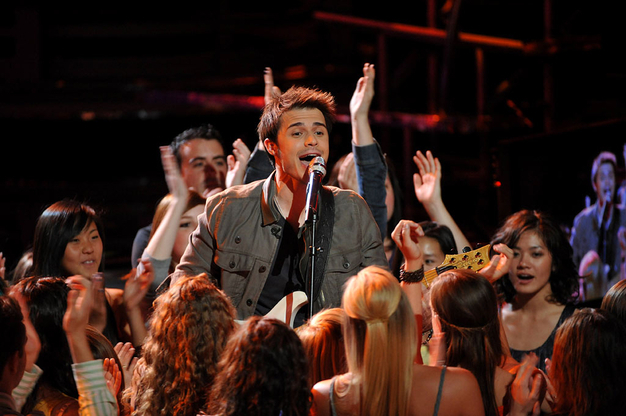 7 - Kris Allen — "All She Wants To Do Is Dance"
I have 4 words for Kris Allen: Sing a little more melody, please! (of course, I'm using the Kara Dioguardi counting system, which has a + or - 3 margin of error!). Kris embellished away from the melody so much, that the essence of the song was distroyed, and we were left to watch Kris do his self-indulgence gyrations in a mosh pit, with adoring-fans drooling on. Arhg! I feel to sing a rebuttal song: "All I Want To Do Is Hurl"
6 - Danny Gokey — "Stand By Me"
Speaking of Embellishing the Melody, Danny Gokeyadded a few hundred too many vocal riffs. He did the ever-typical power singing with his characteristic Gokey Growl. If I were seeing/hearing this for the first time, I might be MORE entertained; but his performance looks and sounds about the same every week — still Gokey is a solid Top 3 contestant. 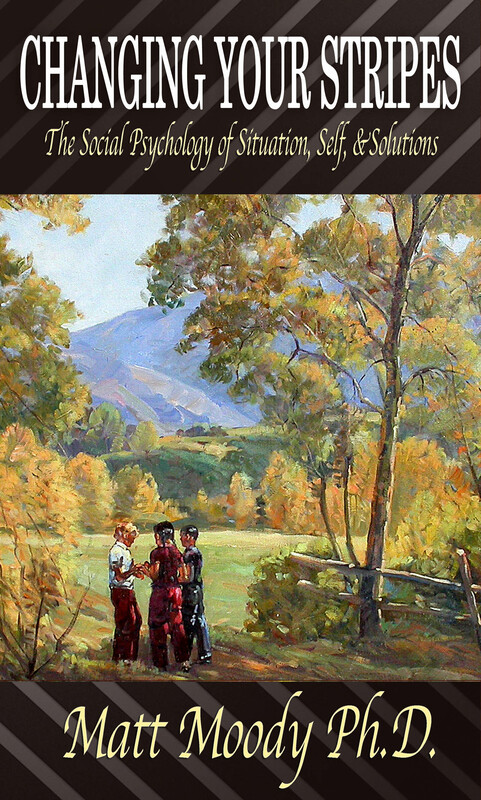 5 - Anoop Desai — "True Colors"
When I close my eyes, Anoop's voice is quite pleasant. And then, when I open my eyes, I'm reminded of a college-student-pretending-to-be-a-rock-star. Can you say "pretentious." Anoop talks about his "fans" . . . wait a minute . . . don't take yourself so seriously tar-heel boy! You have to accomplish something MORE than being on a reality show, to speak of "fans." And Megan jumped into this self-indulgent, pretentiousness too, as she speaks about her "fans." OK, that said, Anoop sang pretty well. He demonstrated how to gently embellish a song, while keeping the basic melody intact. You see, hearing the melody most of the time, creates a familiar comfort zone for the listeners — who learn to love and enjoy particular songs. 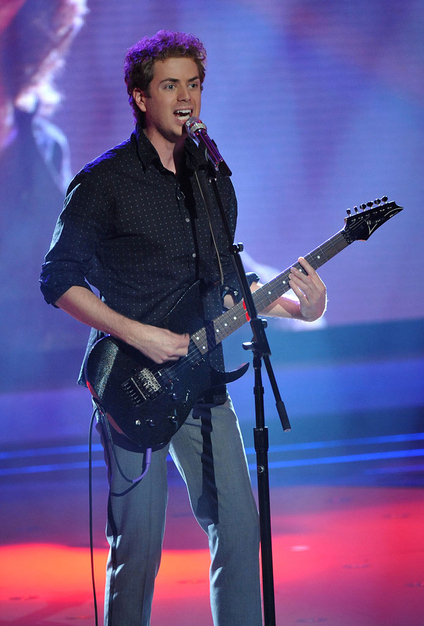 4 - Scott MacIntyre — "The Search Is Over"
Scott really got mixed reviews on this performance. Again, I made up my mind BEFORE the Judges opened their mouths. I liked his performance a lot. He sang with believable passion. And strapping a guitar around his neck, and actually playing it (to the point I could HEAR his strumming -- different from Kris's guitar-as-impressive-decoration). Yeah, I know he strained on a couple of high notes. I'll forgive him for that, while enjoying the rest! 3 - Matt Giraud — "Part Time Lover"
Wow, this guy can riff his guts out! Comparing what Matt did, to Anoop: I can pretty easily approach an imitation of Anoop's performance; but to do what Matt did . . . this take many years of riffing practice to perfect such vocal techniques. 2 - Adam Lambert — "Mad World"
How interesting is this: Everyone in America who watched Adam on time delay, had to find his performance on the Internet. And then, we discover that Simon Cowell gives his a Standing Ovation. Now, let's not get carried away Mr. Cowell. Simon was under presure to end the show in a hurry (after going about 5 minutes over), so the standing "O" was a punchy, succinct way to end the show, and support the producers in putting Adam in the Pimp Spot. Get it? When the Producers put someone in the Pimp Spot . . . even if it's NOT the best performance of the evening, the Judge (a la King's New Clothes), will act like it was the Best Performance of the evening (and the King is NOT buck naked, either). Now, Tracks of my Tears . . . that was Standing-O-worthy! Still "Mad World" had a haunting quality to it, and I'm genuinely curious to watch it over again. It was good! 1 - Allison Iraheta — "I Can't Make You Love Me"
But my favorite perfromance of the night was given by Allison Iraheta. She sang a song that has be done to death on this show, YET when you can sing it as Allison did . . . it was mesmerizing! Loved it! Yet, Simon is right: Allison has a personality that doesn' immediately resonate with the audience; that's precisely why she keep landing in the Bottom 3. But according to Dial Idol AND American Online: she should easily be safe this week. mutilating the melody to an Eagle's classic. How can any sane person guess different from the Dial Idol Data — which has been right 4 weeks in a row (even correctly calling the unexpected demise of Alexis Grace). The most suspense we will have tonight, is finding out if Dial Idol got it wrong? In the end, I think the American Idol Producers can do anything they want. And they typically WANT to go with the Popular Vote, because it is tied to "records sales" and "TV ratings." Nevertheless, is the vote is close between Bottom 3 contestants, I think American Idol can do, and will do, anything they want. Further, they've got to throws some curve balls here and there to keep America on the edge of their seats during the results show! So who's going home? I would not bet against Dial Idol, so Kris is the likely victim, but personally, I think Anoop and Lil are vulnerable — in that order. To make a long story short: Lil Rounds, Anoop Desai, and Scott McIntyre ended up in the Bottom 3. I totally predicted Anoop and Lil — and I also stated that Anoop would be MORE vulnerable to elimination than Lil, . . . and he was! Anoop had the 2nd lowest vote totals; just 30,000 votes more than Scott, who was ultimately eliminated. Scott sang for his life: Two of the judges wanted to invoke the one-time-save rule (most likely Paula and Kara), and two of the judges wanted to kick Scott to the curb (most likely Randy Jackson and the evil Simon Cowell). Scott MacIntyre is such a gentle, likeable personality, and he's sooooooo extremely talented. But America voted him OUT. Bye Bye, Mr. Nice Guy!